For the purposes of this study, “food” is occasionally used to refer to both food and beverages. 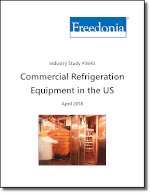 Demand for commercial refrigeration equipment is presented in US dollars at the manufacturers’ level. Unit estimates are also provided for select products. Historical data for 2007, 2012, and 2017 and forecasts to 2022 are presented in current dollars (which are not adjusted to account for inflation).